This is an academic article on endodontics. If you are a patient and have arrived here looking for treatment for a painful or hot tooth then follow the link to our main page on root canal treatment. 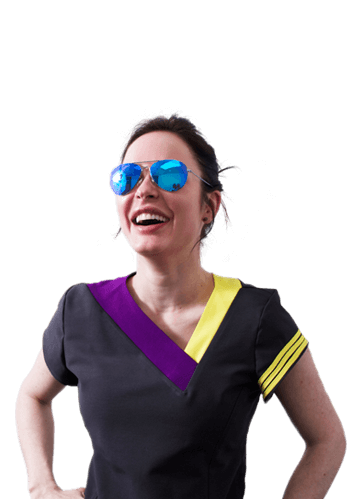 Alternatively if you are a dentist looking to make a referral for a CBCT scan then follow the link here for our dental referrals and CBCT scan page. The first “radiogram” in root canal treatment was produced in 1899 and since, intraoral radiographs, whether analogue or in recent years digital, have become the mainstay of image-based diagnosis in endodontics (Scarfe, Levin, Gane, & Farman, 2009). In recent years, investigations have been made to assess the feasibility of digital subtraction radiology (DSR), ultrasound (US), Magnetic resonance imaging (MRI) and computed tomography (CT); due to its simplicity and ease of use conventional radiography systems have prevailed (Durack & Patel, 2012). High quality three-dimensional imaging systems such as cone beam computed tomography (CBCT) enable visualisation of the maxillo-facial area with a lower patient dose than conventional CT (Durack & Patel, 2012; Scarfe et al., 2009). However, as with any exposure, the possible benefits to the patient must outweigh the risks. Due to its simple technique, low sensitivity but high specificity, periapical radiography is the imaging method of choice for endodontic practice (Mota de Almeida et al., 2014). The interpretation of conventional radiographs is limited by the compression of three-dimensional structures into two-dimensional images, lacking appreciation of the spatial relationship of anatomical structures and being clouded by superimposition of structures, so-called “anatomic noise”. It is complicated by morphological variation, differences in bone density, the angulation of the tube (and difficulty standardising this relative to the subject position) and misrepresentation of the size of any lesion on conventional radiography (Estrela et al., 2008). Furthermore, due to the separation between object and receptor, a minimum of 5% magnification is to be expected. In an attempt to improve spatial perception in conventional radiography, parallax technique can be employed by shifting the tube horizontally by 10-15 degrees; however, this is rarely achieved perfectly due to positioning errors, which are often further exacerbated by bending films for ease of access (Durack & Patel, 2012; Patel, Dawood, Whaites, & Pitt Ford, 2009; Scarfe et al., 2009). Tuned aperture computed tomography (TACT) relies on 8-10 images exposed at different geometries to reconstruct a 3D image. Advantages of less anatomic noise, dosages as low as two periapical films and absence of scatter from metal restorations with resolution of 2D radiographs are cited. Studies by Nance et al 2000 showed 36% detection of MB2 versus no detected lesions in periapical films (Nance, Tyndall, Levin, & Trope, 2000). However, the true rate of MB2 canals is around 85%, which implies that the detection rate of TACT may leave a little to be desired. TACT was mentioned as a novel diagnostic tool in 2009 with exciting applications for the future; however, this has not yet materialised some decade later, so a rapid increase in its use in the short term may not be forthcoming. Magnetic resonance imaging does not use xrays to generate the image, but instead relies on changing the alignment of hydrogen atoms and using radio signals to detect their movements. MRI is not distorted by metallic objects within the mouth. However, the technology for MRI is complex, large and costly, restricting its use for the dental setting. As teeth and bone do not emit signals to be detected, they appear dark on MRI scans. Whilst MRI has been used for salivary gland imaging and is very useful for soft tissues, its use for dental hard tissues is limited. Ultrasound, like MRI, does not use ionising radiation to generate an image. Instead, it relies on varying acoustic properties of tissues to generate a reading. Tissues with greater density will create a greater reflection and be visible as an outline. Whilst useful in the detection of cysts, ultrasound does not effectively pass through bone and as such is often of little use for periapical diagnosis unless the lesion is large and advanced through the cortical plate. Computed Tomography involves taking a series of 2D images and reconstructing them to a 3D representation. The patient is usually supine and passes through the ‘donut’ which contains the radiation source and the sensor. Conventional CT is able to eliminate anatomical noise and has been found to be more effective in the detection of periapical pathology than conventional radiography, at 78% versus 39%. However, resolution depends on the slice interval, and an increase in resolution with a decrease in slice interval will significantly increase the radiation dose to the patient. In any case, the effective dose of conventional CT is often several hundred times that of a periapical radiograph (Patel et al., 2009). With over 40 different models providing varying diagnostic yields available on the market, the basic principles of CBCT are the same (Endodontology et al., 2014). 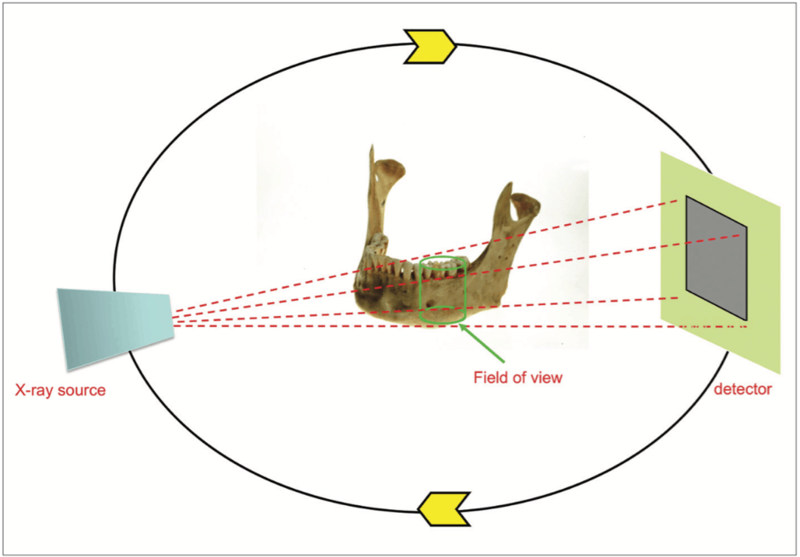 A cone-shaped x-ray beam is emitted and directed from a source that rotates about the patient situated in the centre, with the detector positioned on the opposite side to the beam at all times and rotating correspondingly, as seen in Figure 1 (Durack & Patel, 2012; Scarfe et al., 2009). A scan takes approximately 10-40 seconds, in which time hundreds of images are acquired to reconstruct a cylindrical volume, the individual units of which are known as voxels (3D pixels) (Durack & Patel, 2012). The resultant volume allows appreciation in axial, sagittal and coronal views as a reconstructed image (Durack & Patel, 2012). Since its inception for dental practice use in 2001, access to CBCT is increasing. A recent study by Rosen et al found that 34.2% of respondents had access to CBCT in USA (Rosen, Taschieri, Del Fabbro, Beitlitum, & Tsesis, 2015). Whilst this gadgetry has surely poses improved visibility of structures within the dentist’s treatment field, it is important to consider whether the use of CBCT would significantly change the treatment plan or aid the diagnosis in any event; the long term health risks, especially the potential for malignancy and the risks to children, are unknown (Rosen et al., 2015). A smaller field of view (FOV) is preferred by dental practitioners, as reporting on the images will fall within their competency. For clinicians regularly assessing the temporomandibular joint or performing maxillofacial surgery, larger volumes are required (Scarfe et al., 2009). Smaller volumes benefit from better resolution. As the FOV increases, as does the radiation dose to the patient, so it is important that the FOV is only slightly larger than the area of interest (Endodontics, 2015; Holroyd & Gulson, 2009). An example of classifications according to scan volume has been employed by Planmeca, as seen in Figure 2. Radiation load to the patient is presented in effective dose, measured in micro Sieverts (mSv) (Scarfe et al., 2009). Conventional CT dosages can be as high as 500-1000mSV (Blattner, George, Lee, Kumar, & Yelton, 2010), whereas the doses from modern CBCT units can be as low as panoramic radiographs, at around 13-44mSv. Comparatively, a small intraoral radiograph carries a dose of 1-5mSv (Durack & Patel, 2012; Venskutonis, Plotino, Juodzbalys, & Mickeviciene, 2014). Representative values are shown in Figure 3. When prescribing a CBCT for use in endodontics, or for any purpose, the dosage must follow the ALARA “as low as reasonably achievable”-rule. Imaging parameters such as kV and mA, beam filtration, beam type (pulsed versus continuous) and the shape of the beam contribute to the dose to the subject (Scarfe et al., 2009). Reduction of mA and exposure time reduces dose to the patient (Endodontology et al., 2014), with a smaller FOV for optimal resolution of the endodontic lesion further reducing risk (Endodontics, 2015). However, in an attempt to reduce the dose, noise can reduce resolution, which for endodontic problems so small in nature they are missed on periapical films would defeat the object of taking a CBCT in the first place (Dawood et al., 2009). Conversely, selecting unnecessarily high resolution may not necessarily improve diagnostic outcome (Hassan, Payam, Juyanda, van der Stelt, & Wesselink, 2012). Resolution in CBCT also depends on the voxel size, with smaller voxel size allowing better resolution, but in turn producing a higher dose of radiation to the patient (Endodontics, 2015; Vizzotto et al., 2013). Protocols therefore need to be optimised in order to find the right balance between resolution and dose. CBCT allows appreciation of endodontic disease without any superimposition or anatomic noise often associated with conventional radiography with excellent visualisation of the sometimes complex interplay between tissues and pathology. Due to the isotropic nature of voxels, measurements are geometrically accurate (Durack & Patel, 2012; Mota de Almeida et al., 2014; Scarfe et al., 2009). Advances in equipment mean that whilst still a significant investment, CBCT machines are now attainable by dental practices, with the ease of use of manipulating software certainly playing a part in the rise in popularity (Durack & Patel, 2012). In a study by Mota et al, just 4% of cases referred to endodontic clinics in their study were assessed using CBCT technology. It was found that when used in accordance with the European Commission guidelines, there was a significant impact on therapeutic decision efficacy in the cases selected for imaging, allowing distinction between pathology and normal anatomy. However, It was noted that in order to be entirely of benefit, the proposed diagnostic method of CBCT must have the ability to change the treatment decision and subsequent outcome (Mota de Almeida et al., 2014). Metal restorations in the patient’s mouth can cause issues in the diagnostic acceptability of a CBCT scan output; this causes beam hardening, the result of which is a distorted image with distortion of metal structures or streaks between dense objects (Durack & Patel, 2012; Scarfe et al., 2009; Venskutonis et al., 2014). Artefacts can also be introduced by gutta percha, and also from the scanning equipment (Scarfe et al., 2009; Vizzotto et al., 2013). Patients with advancing age usually have more restorations, but also are more likely to require endodontic treatment. Not only do the restorations play a part in the diagnostic yield of the resultant CBCT image, but advancing age also affects diagnostic value negatively as cortical thinning causes reduced image quality (Ritter et al., 2009). Whilst CBCT allows appreciation of the area of interest in three dimensions, the dose to the patient is significantly higher than conventional radiography and as yet the resolution of CBCT is inferior to intraoral radiographs (Durack & Patel, 2012; Endodontics, 2015). Most practices do not have access to CBCT as for many the cost of the machinery is prohibitively expensive compared to periapical radiography (Mota de Almeida et al., 2014). Furthermore, adequate training is required in order to report on the entire volume rather than simply the area of interest which can pose difficulties for general practitioners wishing to prescribe CBCT (Endodontology et al., 2014; Estrela et al., 2008). In order to critically appraise the advantages and limitations of CBCT in endodontic practice, specific applications must be assessed; endodontics is a field with a vast array of requirements for imaging. In order to achieve a resolution that makes it possible to appreciate the complex clinical situation for which the CBCT has been ordered, such as investigation into the periodontal ligament space with an average dimension of just 0.2mm, voxel size needs to be less than 0.3mm (Scarfe et al., 2009), some even advocating 0.08-0.125mm for fine resolution (Dawood et al., 2009). The justification of the exposure must be weighed up against the possible diagnostic benefit, however many feel that currently the selection criteria for the use of CBCT in endodontic practice is not transparent enough (Rosen et al., 2015). The following recommendations for the use of CBCT in endodontics have been established, which draw on the information supplied by the European Commission and the joint position statement of the American Academy of Endodontists and the American Academy of Oral and Maxillofacial Radiology; the intent is for these guidelines to be used in conjunction with clinical decision making in order to arrive at a sound diagnosis. The recommendations in the joint position statement issued by the American Academy of Endodontists and the American Academy of Oral and Maxillofacial Radiology were that CBCT should only be used in the treatment of complex endodontic cases, and periapical radiography was to remain the first choice for diagnostic and postoperative imaging. Emphasis was placed on the need for a comprehensive examination prior to any CBCT prescription (Endodontics, 2015; Endodontology et al., 2014; Mota de Almeida et al., 2014). A larger field of view obtained by a CBCT may be justified if the endodontic lesion or pathology extends beyond the parameters of what can be viewed on a conventional radiograph (Endodontics, 2015). The periapical status of a tooth is important in arriving at a diagnosis and formulating a treatment plan (Kruse, Spin-Neto, Wenzel, & Kirkevang, 2015). This uses clinical information alongside radiographs, the advantage of which is the visualisation of the apical lesion in a non-invasive, accurate manner (Abella et al., 2012). With conventional radiography, assessment of apical pathology can be difficult due to anatomic noise, often resulting in the size of the lesion being underestimated (Cheung, Wei, & McGrath, 2013). Lesions confined to cancellous bone are often missed on periapical radiographs due to the masking of the lesion by the overlying cortical plate. Only when the lesion has expanded to erode the cortical plates are they likely to be readily visible on a radiograph, after resulting in 30-50% bone mineral loss. Those very close to the sinus floor may be missed altogether (Estrela et al., 2008; Kruse et al., 2015; Patel et al., 2009; Venskutonis et al., 2014). The absence of radiographic change therefore does not directly imply an absence of periapical inflammation (Cheung et al., 2013). It is also thought that performing endodontic treatment prior to visible changes on the radiograph improves outcome scores (Durack & Patel, 2012). This is where CBCT could be an exciting addition to the endodontist’s armamentarium. Multiple studies have found CBCT to be a diagnostic tool with high sensitivity for the detection of periapical pathology, far outweighing the diagnostic accuracy of radiographs (Durack & Patel, 2012). A study by Lofthag-Hansen et al showed that more periapical lesions were identified using CBCT than conventional radiography (Lofthag-Hansen, Huumonen, Grondahl, & Grondahl, 2007), which was confirmed by Estrela et al in their research on scoring periapical lesions and diagnostic efficacy of CBCT, showing that apical periodontitis is often present but undetected on conventional radiographs which were then scanned with CBCT suggesting high false negatives in 2D imaging (Estrela et al., 2008). Scarfe et al compared various imaging methods to find that the diagnostic accuracy of CBCT is 61%, versus 39% for digital and 44% for conventional radiography in the detection of apical periodontitis (Scarfe et al., 2009). Patel et al found that apical periodontitis was detected in 24.8% of cases with intraoral radiographs versus 100% of cases with CBCT (Patel et al., 2009); the same author followed up with further research some three years later and found that CBCT identified twice as many periapical lesions than CBCT in one research study (Patel, Wilson, Dawood, Foschi, & Mannocci, 2012) and a 62% more lesions in another (Durack & Patel, 2012). Figure 4 shows a comparison between a periapical radiograph and a CBCT for the same tooth, and the difference in diagnosis possible with each, further highlighting the issues surrounding anatomic noise in 2D imaging and the efficacy of CBCT. The size of the lesion is relevant for diagnosis. Tsai et al found that in lesions smaller than 0.8mm, CBCT demonstrated poor accuracy, in those larger than 0.8mm the diagnostic accuracy was good, and above 1.4mm the diagnostic accuracy became excellent (Tsai, Torabinejad, Rice, & Azevedo, 2012). Put into perspective, even at 1.0mm where conventional radiography may struggle to identify the lesion unless perforation of the cortical plate has occurred, CBCT could be a useful tool in identification of early apical periodontitis, especially in a tooth where the symptoms are vague (Patel et al., 2015). A question that has been posed many times is whether the use of CBCT in the detection of apical periodontitis is likely to result in a change to the treatment plan. Abella et al suggested that strategy, the type of irrigant used and case management may be influenced by access to CBCT (Abella et al., 2012). Whilst undoubtedly the diagnosis can be facilitated by its use, Balasundaram et al came to the conclusion that it it is unlikely to significantly modify the treatment plan (Balasundaram et al., 2012). Whilst guidelines have been suggested, there is no definitive protocol for CBCT in the use of periapical diagnosis and it is unknown whether the outcome for the tooth will change significantly with the use of CBCT (Kruse et al., 2015). As the distance between the inferior dental nerve and the lower molars can be accurately measured on only approximately half of all periapical radiographs, planning surgical endodontics with the use of CBCT, especially when adjacent to anatomical sites such as sinuses or nerves, can reduce morbidity significantly (Durack & Patel, 2012; Venskutonis et al., 2014). It has been suggested that in around 70% of scanned cases, a CBCT showed clinically relevant information that had been missed on periapical radiographs (Venskutonis et al., 2014). CBCT may assist in identification of horizontal root fractures which are difficult to diagnose on conventional radiography – unless the xray beam passes exactly through the fracture line, thus making it visible. Accurate diagnosis improves outcomes as it affects treatment decisions (Durack & Patel, 2012). The peak incidence of traumatic dental injuries is between three and nine years, where extraoral imaging may be preferred to intrusive intraoral methods, especially if the child is distressed (Durack & Patel, 2012). However, the risk posed by radiation versus the benefit of the information available with the use if CBCT must be carefully weighed up. Vertical root fractures (VRF) are often difficult to diagnose until they have been established for some time (Durack & Patel, 2012). Hassan et al showed that CBCT has increased sensitivity in the detection of vertical root fractures over periapical radiographs (Hassan et al., 2012), and even that a low resolution CBCT has increased accuracy in diagnosis (Venskutonis et al., 2014). Patel et al, in 2015, recommended that CBCT should not be relied upon for the diagnosis of VRF due to the likelihood of minor subject movement affecting scan quality. It is however, probable that periradicular changes as a result of VRF will be visible on CBCT images prior to them being perceived on intraoral radiographs (Patel et al., 2015). It is known that accurately assessing canal number and morphology can help avoid repeat or surgical intervention (Durack & Patel, 2012). 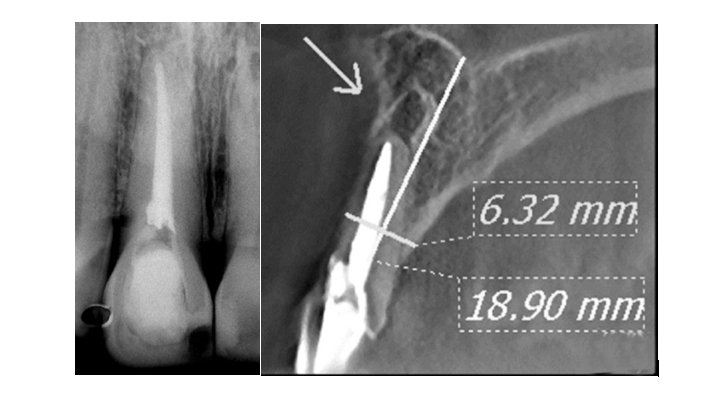 CBCT assessment can be useful at the assessment stage to gauge canal number, the presence of dilacerated roots or aberrant morphology such as dens in dente in order to reduce the risk of perforation, transportation or ledges and avoid exploratory procedures (Durack & Patel, 2012; Todd, 2014; Venskutonis et al., 2014). Conventional radiography often overlooks supplemental canals and their omission in treatment can lead to endodontic failure (Blattner et al., 2010; Durack & Patel, 2012). It is accepted that maxillary first molars have an incidence of 69-93% second mesio-buccal (MB2) canals and that their successful treatment is important to the outcome of root canal treatment (Blattner et al., 2010; Vizzotto et al., 2013). Studies have shown that there is a reduced detection of MB2 canals when using intraoral radiography compared with CBCT, and that conventional periapicals fail to detect the MB2 in up to 40% of maxillary first molars (Vizzotto et al., 2013). Compared with CBCT, which had detection of 3.58 canals on average in an upper first permanent molar, the detection rate with periapical radiography was just 3.1 canals (Scarfe et al., 2009). Diagnosing MB2 canals using CBCT shows no difference in identification between 0.2mm and 0.3mm voxel size, suggesting that a dose-reducing protocol with a larger 0.3mm voxel size is sufficient (Vizzotto et al., 2013). An interesting observation is, however, that there is only a single study comparing the effectiveness of identification of the MB2 canal between CBCT and microscopy, which would pose zero radiation dose and thus risk to the patient. CBCT is not indicated as a standard method to demonstrate root canal anatomy over microscopy, which results often in adequate vision of canals with no radiation dose (Abuabara, Baratto-Filho, Anguigar Anele, Leonardi, & Sousa-Neto, 2013; SEDENTEXCT, 2011). The prognosis of a tooth with a resorptive defect is improved if detected early, and treatment efficacy relies on correct diagnosis (Bernardes et al., 2012; Todd, 2014). Resorptive defects on the buccal or lingual surfaces are difficult to see with intraoral radiography and will often be missed on conventional radiographs (Bernardes et al., 2012). However, comparative studies on the use of conventional imaging versus CBCT on resorptive lesions are limited (Durack & Patel, 2012). It is accepted that assessment with CBCT in three dimensions is more effective than 2D radiography (Scarfe et al., 2009), and has been shown to have statistically higher detection rates (Bernardes et al., 2012). The difference between internal and external resorption is often difficult to visualise on periapical radiographs (D’Addazio et al., 2011). External inflammatory root resorption (EIRR) after trauma is common, at 5-18%, and as high as 30% after avulsion, and is responsive to root treatment. The outcome for EIRR can be improved by early diagnosis with CBCT; however, currently this is often prescribed when evidence of resorption has been established with conventional radiographs, which is rarely early stage (Durack & Patel, 2012). With the current guidelines, the timing of when a CBCT should be undertaken is unclear; repeated exposures are difficult to justify (SEDENTEXCT, 2011). Endodontic complications and failure can be difficult to discern on conventional radiographs. CBCT can assist in planning a remedy and estimating the prognosis (Todd, 2014; Venskutonis et al., 2014) and results in the identification of a significantly higher number of endodontic mishaps than periapical radiography (D’Addazio et al., 2011). Perforations can result in inappropriate treatment. In over 80% of cases, perforations are missed on conventional radiographs. In a comparative study by D’Addazio, perforations were recognised in all cases evaluated with CBCT. Post deviations were identified in 60% of cases with CBCT, versus 40% in the non-CBCT group (D’Addazio et al., 2011). CBCT is less useful in the detection of separated files than periapical radiography. In the same study by D’Addazio, CBCT did not visualise 60% of files but identified 40% accurately, whereas radiographs did not see 40% of files but identified 60% accurately – this is possibly due to reduced resolution on CBCT as compared with radiographs (D’Addazio et al., 2011). Endodontic complications therefore have mixed benefit from diagnosis with CBCT and the selection should be on a case by case basis. The success of root canal treatment is measured by the trifecta of lack of periapical pathology, adequate horizontal and vertical obturation and the absence of symptoms (Wesselink, 1994). With CBCT, voids and shortcomings in the root filling can be visualised (Decurcio et al., 2010), and when using this in posttreatment evaluation, lower healing rates have been reported and root fillings considered sub-optimal (Durack & Patel, 2012; Patel et al., 2012; Venskutonis et al., 2014). The healing rate one year postoperatively, comparing periapical radiography with CBCT, is 87% versus 62.6% (Patel et al., 2012). This begs the question as to whether current quoted success rates are exaggerated by the use of periapical radiographs, whether these lesions are merely taking longer to resolve under the scrutiny of CBCT technology, or whether the endodontic procedure has in fact failed. The usefulness of CBCT is undisputed in all dental disciplines including endodontics (Patel & Horner, 2009), especially with the introduction of machines capable of low dose and small FOV (Vizzotto et al., 2013). The effective dose of CBCT is significantly higher than intraoral radiography, and if respecting the ALARA principle, the dose must reap significant benefits considering the increased risk to the patient. CBCT should therefore not be used routinely, but is justified on a case-specific, individual basis when the information cannot be gleaned from lower dose diagnostic tests (Durack & Patel, 2012; Endodontics, 2015; Rosen et al., 2015). Used correctly and reserved for complex endodontic problems, it can have significant impact on therapeutic decision making when used in accordance with the European Commission guidelines (Balasundaram et al., 2012; Mota de Almeida et al., 2014). Even though the radiation dose to the patient is higher, the imaging method more technique sensitive and the equipment costlier than conventional radiography, CBCT has become popular in general and specialist practices alike. Whilst advances in imaging are no doubt on the horizon, X-ray imaging including the use of CBCT is likely to be difficult to unseat from mainstay use. CBCT is undoubtedly valuable for diagnosis of pathology. It is sometimes difficult as clinicians to justify a CBCT scan when there is an absence of pathology on periapical radiographs. Whilst there are guidelines on the use of CBCT in endodontics, they can be made to be universally applicable. There is a need for further studies considering the impact of the use of CBCT on the management of endodontic disease, and whether there should be a follow up assessment given the variance in periapical versus CBCT images and the difference in outcome measure. Currently, treatment strategies seem to change only in the presence of resorptive lesions. Any imaging is only a snapshot in time, and as such critical evaluation of the need, and the timing of any radiographic examination must be carefully appraised. The introduction of CBCT to the endodontic practice is exciting and has scope; however, it is not a panacea and its usage should be limited to justifiable applications. Abuabara, A., Baratto-Filho, F., Anguigar Anele, J., Leonardi, D., & Sousa-Neto, M. (2013). Efficacy of clinical and radiological methods to identify second mesiobuccal canals in maxillary first molars. Acta Odontol Scand, 71(1), 205-209. Decurcio, D. A., Bueno, M. R., Alencar, A. H. G., Porto, O. C. L., B.C., A., & Estrela, C. (2010). Effect of root canal filling materials on dimensions of cone-beam computed tomography images. J Appl Oral Sci, 2012(20), 2. Durack, C., & Patel, S. (2012). Cone Beam Computed Tomography in Endodontics. Braz Dent J, 23(3), 179-191. Holroyd, J. R., & Gulson, A. D. (2009). The radiation protection implications of the use of cone beam computed tomography (CBCT) in dentistry – what you need to know. Health Protection Agency Centre for radiation, chemical and environmental hazards. Nance, R., Tyndall, D., Levin, L. G., & Trope, M. (2000). Identification of root canals in molars by tuned-aperture computed tomography. Int Endod J, 33, 392-396. Planmeca. (2018). The Planmeca ProMax 3D family. http://www.planmeca.com/Imaging/3D-imaging/, accessed 07/01/2018. SEDENTEXCT, P. (2011). Radiation Protection 172. Evidence Based Guidelines on Cone Beam CT for dental and maxillofacial radiology. http://www.sedentexct.eu/content/guidelines-cbct- dental-and-maxillofacial-radiology, accessed 30/12/2017. Todd, R. (2014). Dental imaging – 2D to 3D: a historic, current and future view of projection radiography. Endodontic Topics, 31, 36-52. Wesselink, P. R. (1994). Consensus report of the European Society of Endodontology on quality guidelines for endodontic treatment. Int Endod J, 27(3), 115-124.